This timely book explores the wisdom of the Gnostic Jesus, who challenges our preconceptions about the world and ourselves. 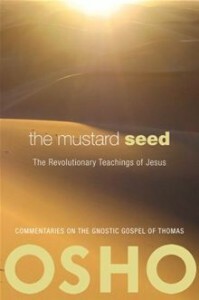 Based on the Gospel of Thomas, the book recounts the missing years in Jesus’ life and his time in Egypt and India, learning from Egyptian secret societies, then Buddhist schools, then Hindu Vedanta. Each of Jesus’ original sayings is the “seed” for a chapter of the book; each examines one aspect of life – birth, death, love, fear, anger, and more – counterpointed by Osho’s penetrating comments and responses to questions from his audience.